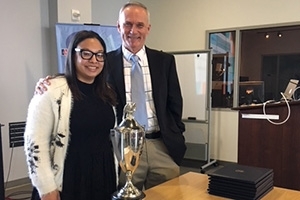 Graduating journalism major Ambar Pardilla received the Rodger Streitmatter Award. American University School of Communication (AU SOC) recognized its top journalism students last night, inducting nine new members into the Kappa Tau Alpha (KTA), the National Honors Society, and announcing a new suite of awards that recognize and reward quality news projects by undergraduate journalism majors, as well as presenting the Rodger Streitmatter Journalism Award for Excellence. The new Journalism Awards Program is possible due to the creativity and generosity of a committed American University alumnus, who prefers to remain anonymous, who developed the honors "to encourage students to commit their talent and energy to the field of journalism." Six undergraduate award winners receive a $300 prize. Journalism Division Director Amy Eisman praised the alumnus and welcomes the focus on budding journalists. "This highly engaged donor proposed the Journalism Awards Program at a time when accurate, deeply reported and clearly presented news and information is more important than ever, regardless of platform," she said. The Streitmatter award is named for Rodger Streitmatter, SOC alumnus, former newspaper reporter, cultural historian and a popular professor at AU. It was created by his husband, Thomas B. Grooms, and includes $2,000 prize, a certificate, and the winner’s name engraved on a trophy that will be kept at SOC. Learn more about the BA in Journalism at SOC.